Sue from New York and I first came into contact with each other through the American Diabetes Association message board. My husband had gone on Medicare and discovered that his Continuous Glucose Monitor (CGM) would not be covered by Medicare, and I needed to get in contact with someone who might answer some questions as to what I needed to do to fight the guideline that Medicare had that prevented the coverage of the CGM. Sue from New York posted an answer to my CGM inquiry even though she wasn’t on Medicare as yet. I think that we may have chatted very briefly on the forum before I asked her for her email address so that we could communicate privately. After emailing for a month back and forth, I asked her for her phone number. I thought it would be easier to speak on the phone. She sent me her phone number and we started talking on the phone a few times a week and really became good friends. At some point, she suggested that I contact Laddie about doing some blogs on Laddie’s Test Guess and Go site. Sue and her husband decided to take a road trip last week. They started off in Maryland, then went to West Virginia, and on the final leg of their journey came to Harrisburg, Pennsylvania, where I live and spent a few days with my husband Marc and me. We had a great time meeting in person and being able to speak to each other face-to-face. Sue and I thought it would be interesting for me to have a conversation with her husband Steve as spouses of diabetics. She, in turn, had a conversation with my husband Marc. The following is a result of my conversation with Steve. Sue from PA: What was your reaction when Sue was diagnosed as a diabetic? Steve: I thought that since we had gotten through it with our son Steve, who was diagnosed as Type 1 at age 4, that hers wouldn’t be as bad because she was diagnosed as a Type 2. I was worried, but I knew I could handle it. Steve: How was it when Marc was diagnosed for you, because you hadn’t been through it? Sue from PA: Initially when Marc came home from the doctor and told me he had diabetes, I was pretty shocked. Then I started to educate myself about diabetes and I realized that I had a misconception of what it involved food-wise. I always thought that you couldn’t have sugar. I soon learned that sugar was the least of my worries. It was actually carbohydrates that were the real villains since they turn into sugar. Sue from PA: What do you do to help Sue with her diabetes management? Steve: I keep track of her monitoring, make sure that she is taking her medications, help her with her placement of her pods (OmniPod is the pump that she uses to deliver her insulin), help her when she is hypoglycemic and make sure she gets something to eat or drink to bring her blood sugar back to normal. At times I have taken her place in watching the grandchildren and have taken them places where she would have taken them normally, and at times I have driven her to the store when she has needed to get something and didn’t feel as though she could drive. Steve: How long has Marc had his diabetes, and how have you taken care of him? Sue from PA: Marc has had his diabetes for approximately 19 years. I am very fortunate in that he can do his everyday care by himself. He is totally responsible for his insulin pump and when he had a CGM he was totally responsible for changing his sensors. Basically, I manage his food by counting his carbs for each meal that I prepare. I am responsible for saving his life when he gets hypoglycemic, and I am constantly reminding him that he owes me big time since I’ve had to save him more times that I can count of my two hands. I have learned to give him the glucagon when he blacks out and I have leaned to recognize the symptoms when he starts to go low. Steve: Sue has also told me that she doesn’t know what she would have done without me and how grateful she is that I have been able to help her through this. 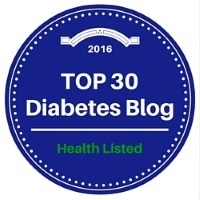 Sue from PA: Emotionally, what’s it been like to live as the spouse of a Type 1 diabetic? Steve: At times it has been very stressful. At times I am truly emotional over it. Sometimes I have been scared but I made a commitment in my wedding vows, in sickness and in health to love her always and I would never leave her because of her health. Steve: On that same topic, how has it been for you? Sue from PA: (Heavy sigh). It’s been a challenge. I don’t think there is ever a day when I don’t worry about him. One of the biggest issues for us is the lack of his having a CGM due to being on Medicare and them not covering it. When my children became independent and were able to be out on their own at night, as most mothers do, I never truly fell into a deep sleep until they were home and the house was locked up. Now I never fall into a deep sleep even though my husband is right beside me. I am always aware that in the snap of a finger he can go into a hypoglycemic low, at which point I might have to jump out of bed, and I literally mean jump, to make sure to get juice or a soft drink into him to prevent him from going unconscious. During those times when it’s happening so fast that he does become unconscious, I need to give him the glucagon. Even though I’ve done it numerous times, my hands still shake and my heart beats almost out of my chest. I’m just always worried when I am not with him. I can understand how you feel, Steve, because I feel the same way. I will always honor my wedding vows. But you have to make light of it sometimes to be able to live with the situation. I can truly say that seeing someone you love having a hypoglycemic low is something you never forget. They are drenched in sweat, their eyes are unfocused and they have no idea of what is happening. It’s frightening. Sue from PA: Steve, do you have anything else you want to add to this conversation? Steve: In less than a year Sue will turn 65 and will go on Medicare. I hope and pray that when her insurance no longer covers her, Medicare will be there to cover her with her diabetic supplies and necessary devices that she needs, i.e. her CGM. Sue from PA: Diabetes had been a true education for me. Because of Medicare’s lack of coverage of the CGM, I have become an advocate. I have done things I would have never thought I could do. I blog, I did a podcast, I wrote an article for my local newspaper, and recently I have become involved in S-2689, the Medicare CGM Access Act that was introduced into the Senate on July 30, 2014 by Senators Susan Collins (R-ME) and Jeanne Shaheen (D-NH). It addresses the growing concern that people with Type 1 diabetes who are over the age of 65 cannot obtain coverage for the critical and potentially life-saving Continuous Glucose Monitor (CGM) through Medicare, even if they used these technologies successfully prior to becoming Medicare eligible. A few weeks ago I sat in on a telephone conference with representatives from Dexcom, Medtronic, J & J and Animas and also a representative from the endocrinologists association, among others. I was one of just a few to be invited to sit in on this telephone conference. Sue from PA: I thank Steve for having this conversation with me. Most of the people I come into contact with are the diabetics. I’ve not had much contact with the spouses and it’s good to be able to speak about what it’s like for us, the caretakers. I hope that we can have more conversations in the future. In closing, I would like to ask everyone reading this who has not yet signed the JDRF Petition or clicked on the link that asks their Senators to support S-2689 to please do so. It’s so important to the many diabetics on Medicare who cannot get a CGM because it isn’t covered by Medicare. So many are on fixed incomes and can’t afford the cost of the CGM and the sensors. If you are interested in participating in the Conversations project, click here for information.